Spurred by Dubya's recent economic stimulus plan (dubbed "Reaganomics II" by some of the media), I started playing with historic financial data for the United States. 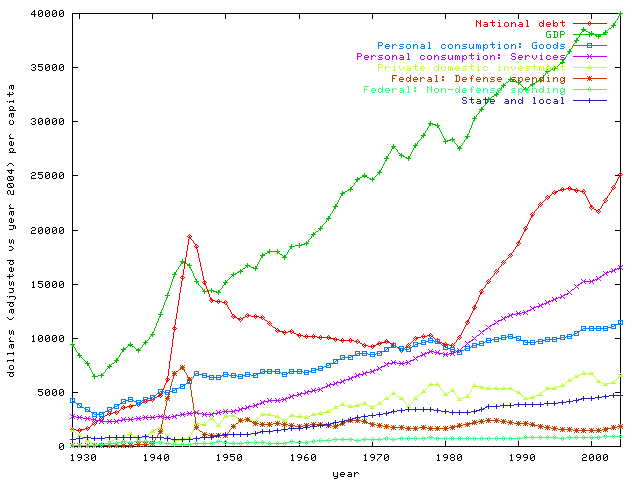 So I dug up national debt, inflation, census and population estimates, and gross domestic product component data and started graphing to see if I could find anything interesting about how we've interacted with debt in the past. This makes the big jumps way less obvious, but shows a lot more detail in the changes. 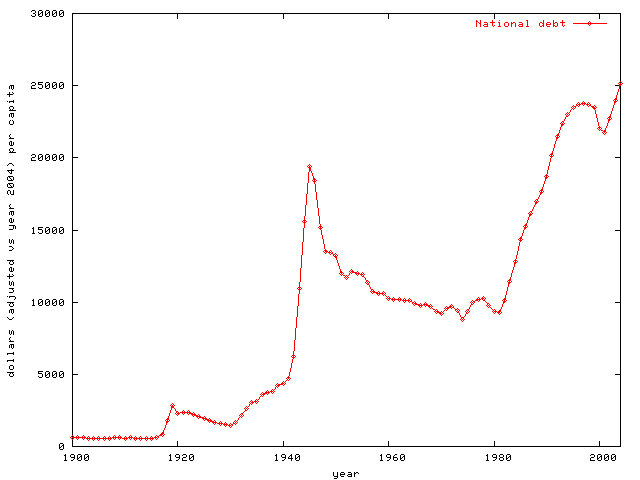 Except for a brief period between 1830 and 1840, the debt hasn't really done much of anything but go up. Or with the more detailed population estimates for 1900-2004: This makes it seem like we didn't carry much debt for the first 100 years of the country, then incurred massive amounts during the Civil War, World War I, World War II, and Reaganomics. 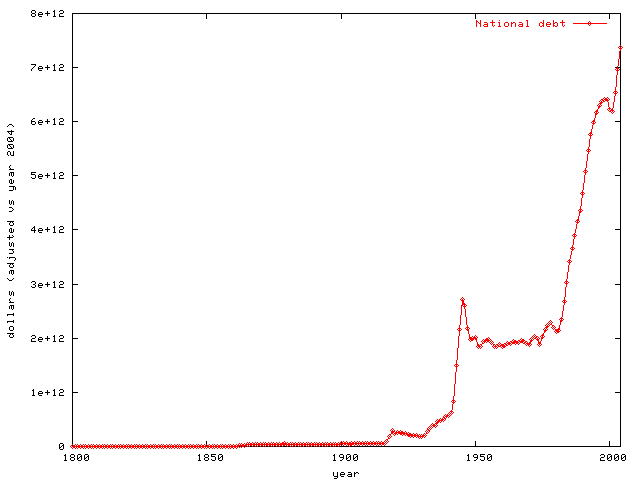 Though we never actually pay off the debt, the debt per person seems to shrink by about a third as the population expands, before the country gets sucked into the next Big Thing. Graphing historical data for a whole country somehow feels empowering. You know that you could track down stories to go with each little bend in the graph. Oh, notice that as of the year 2004, you personally owe somebody else over $25,000 on behalf of our government. Woohoo. Then I found a breakdown of the Gross Domestic Product for every year since 1929. Adding that to the graph, I'm starting to get a sense that either I'm misunderstanding the idea of GDP or the Consumer Price Index (what "inflation" is based on), or the average American was a lot poorer than I was imagining back in the day. Maybe this is just showing less specialization. People were more self-sufficient, not relying on society and the exchange of money for common goods and services? 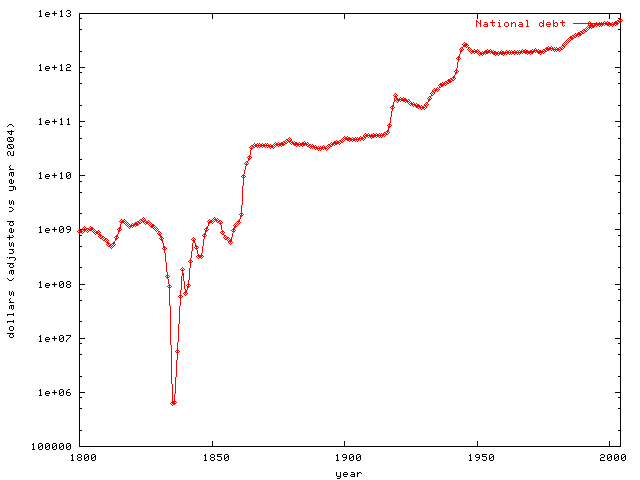 But looking at this, the national debt hasn't grown as wildly as it first appeared. Except for WWII, its managed to grow roughly linearly with the GDP. 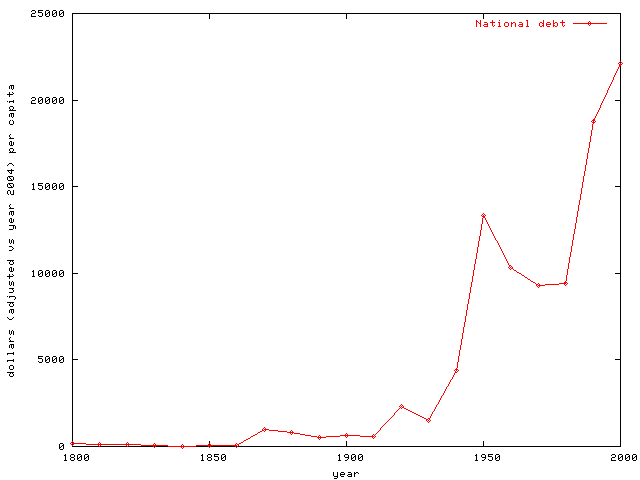 I wanted to see what portion of the GDP things like the national debt, defense spending, etc were. 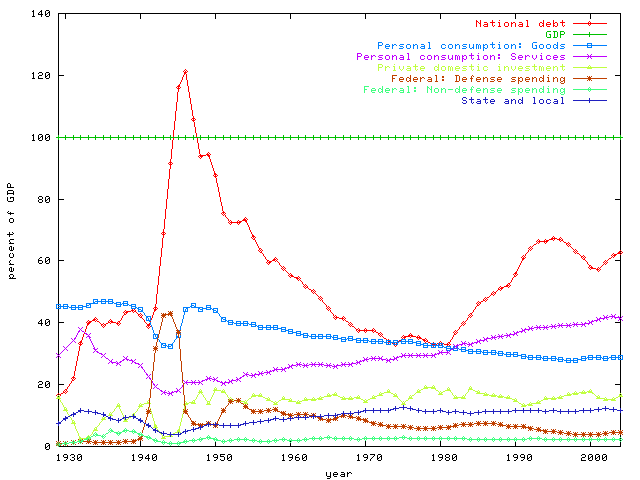 Compared directly to the GDP, this tells an interesting story about WWII; personal consumption and private investment took a back seat to defense spending, and the nation racked up huge debt to pay for it. For a few years, the amount the country owed was more than all of the money exchanged within it could pay for in a year; this seems impressive somehow.